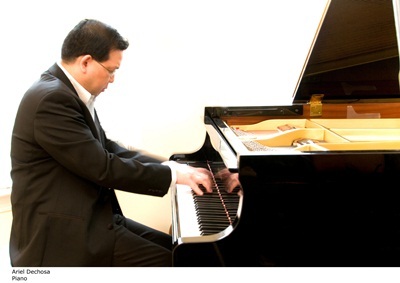 Eminent Filipino pianist Ariel Dechosa returns to the CCP stage in a concert with the Philippine Philharmonic Orchestra (PPO) in its 4thconcert series slated on December 16, 2011, Friday, 8:00 p.m. at the Cultural Center of the Philippines’ Tanghalang Nicanor Abelardo (CCP Main Theater). Maestro Olivier Ochanine conducts. Dechosa will perform Beethoven’s Piano Concerto No. 4. Program also includes Ravel’s Le Tombeau de Couperin, and Rachmaninoff’sSymphony No. 2. Dechosa is a National Music Competition for Young Artists awardee. 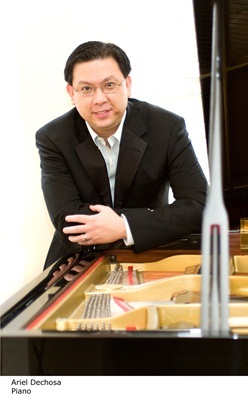 He also won the 1996 Frinna Awerbuch International Piano Competition (3rd prize), 1994 Santa Barbara Symphony International Piano Competition (3rd prize), the 1993 Five Towns Competition (1st prize), and the 1991 Great Neck Symphony Young Artists Competition (1st prize). Dechosa won a scholarship to study at the Manhattan School of Music in New York City, where he subsequently earned his Bachelor and Master of Music degrees under the tutelage of Prof. Arkady Aronov. Upon graduation, he was given the prestigious Harold Sauer-Award, the highest prize bestowed to a graduating pianist. He also studied at the Peabody Institute in Baltimore where he earned a Graduate Performing Diploma as a student of Boris Slutsky. He has taken regular master classes with Leon Fleisher, Paul Badura-Skoda, Vladimir Feltsman, and Ruth Laredo. An active soloist and chamber musician, Dechosa has performed in Weill Recital Hall at Carnegie Hall, Merkin Hall, and Corcoran Gallery of Art, among others. He has played with the Northwest Sinfonietta in Seattle and the Philippine Philharmonic Orchestra performing Beethoven’s “Emperor” Concerto. He has also been invited to perform at music festivals in the La Schola Cantorum Piano Series in Paris, Merano Festival in Italy, and the Lasker Music Festival in North Carolina. Ariel Dechosa resides in Inwood, West Virginia with his wife Vivian, and teaches at Gilman School in Baltimore, Maryland. He is currently the Music Director of Inter-Atlantic Music Foundation based in the USA and Bulgaria. Ticket prices: P1000/800/500/P350/200, with discounts available to students, senior citizens and groups. Subscription packages are also available for eight (8) or four (4) shows. For inquiries and subscriptions, please call the CCP Marketing Department (832-1125 loc. 1806), the CCP Box Office (832-3704) or Ticketworld at National Bookstore (891-9999).